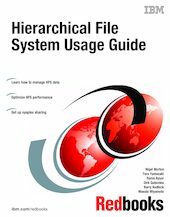 This IBM Redbooks publication explains the recent performance enhancements in the DFSMS/MVS Hierarchical File System as used by OS/390 UNIX System Services. It shows you how to set up and manage sharing of HFS data sets in a sysplex and gives practical examples of how to back up and recover HFS (including multi-volume HFS) data sets in a sysplex environment. The use of Tivoli Storage Manager for file-level backup is also described.